Use the Tableau Services Manager (TSM) Web UI or CLI commands to configure the topology of a node. The initial node is configured with a default that includes all the processes used by TSM and Tableau Server. When you add additional nodes you need to specify which processes will run on those nodes, and how many instances of those processes will run. You may also want to change the topology of the initial node, either adding instances of existing processes, or moving some of those processes to your additional nodes (this is common when setting up a distributed installation of Tableau Server). Note: You cannot remove the File Store or Repository (pgsql) if this is the only instance of that process in your cluster. 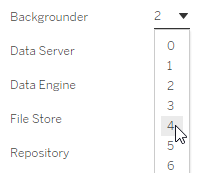 You must have at least one instance of each of the processes in your Tableau Server installation, and you must add the second instance and allow it to synchronize with the first before you remove the process on the original node. For more information see Move the Repository Process and Move the File Store Process. In most cases, you can make multiple changes to your server configuration. Exceptions are if you are moving or removing a File Store instance or the Repository. Your next steps depend on the configuration changes you want to make. Add processes—Add processes to a node by specifying the number of instances you want on the node, or selecting the box for the process. Adding Backgrounder to a node will also add an instance of Data Engine if one is not already on the node. Note: The TSM Web UI limits you to a maximum of 8 instances of processes that allow you to select the number of instances. To configure more instances than this, use the command line and the TSM topology set-process command. For more information, see tsm topology set-process. Change process count—Change the number of processes on a node by specifying the new number, or selecting the box for the process. Remove a process completely—Remove all instances of a process from a node by clearing the box for the process, or setting the count to 0 (zero). In most cases you move a process from one node to another by setting the process instance count on the first node to 0 (zero), and setting the count to a non-zero value on the second node. If you are attempting to make a configuration that is not allowed (if, for example, you try to remove a File Store that has not been decommissioned), a message displays to let you know this. Click Pending Changes at the top right, and Apply Changes and Restart to commit the changes and restart Tableau Server. To configure nodes, run commands from the initial node and use the node ID to specify which node you are configuring. To determine the node ID, use the tsm topology list-nodes command. Use the tsm topology set-process command to add, update or remove a process on a node. You need to specify the node you are configuring, the process you are adding, updating, or removing, and the number of instances of the process. After setting the topology for a node you need to apply the changes to Tableau Server. Apply changes using the tsm pending-changes apply command. After the changes are applied, Tableau Server is returned to the state it was in before the command was run. This means that if it was running, it will be restarted, and if it was stopped it will remain stopped after pending changes have been applied. In most cases, if Tableau Server is running when you apply pending changes, the server is stopped so that changes can be applied, and then restarted. The exception is if you are changing the number of instances of Backgrounder, or VizQL Server on an existing node. With changes to those processes on an existing node, Tableau Server does not have to be stopped if it is running. Note: Examples here show some process names. For a complete list, see Tableau Server Processes. Use the tsm topology set-process command to add a process to a node. You need to specify the node you are configuring, the process you are adding, and the number of instances of the process. Add processes on the node by specifying the process and the number of instances. Change the number of processes on a node by specifying an already configured process and providing a new value for the number of instances. Change the number of processes on the node by specifying an already configured process and providing a new value for the number of instances. Remove a process from a node by specifying a count of 0 instances for that process on the node. In most cases you move a process from one node to another by setting the process instance count on the first node to zero, and setting the count to a non-zero value on the second node. Move a process from one node to another node by specifying a count of 0 instances for that process on the first node and specifying a count of 1 or greater to the second node.